When the laptop’s battery doesn’t work as expected, there are ways to test it, without buying a new battery and later finding out, the problem lay in the laptop’s battery charging circuit. There are a few possible scenarios – battery’s capacity could simply drop below the designed rate over time, battery protection circuit could be activated, the laptop’s charging circuit could be faulty, communication paths between the laptop and battery could be open, charging power adapter could be faulty or not supplying enough current to charge the battery or a signal pin on power supply adapter could be broken and thus not properly identifying itself to the laptop. A charger tip, compatible with the brand and model of the particular laptop. It could be acquired via Ebay if it wasn’t supplied together with the GetGui charging adapter. The first step is to identify notebook’s power requirements. 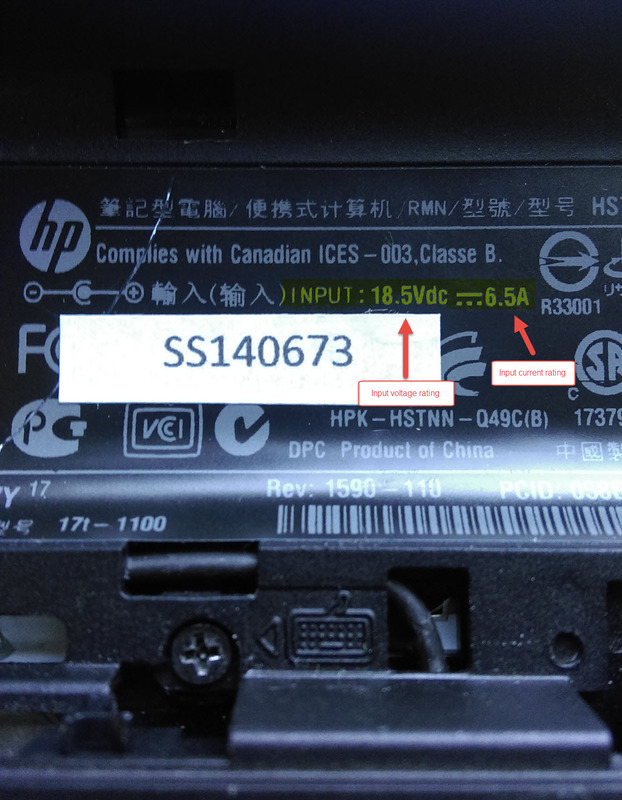 They are usually written on the laptop’s bottom casing, below the battery (battery needs to be removed) or in some cases, on the bottom side of the laptop. Look for the INPUT power rating. In the picture below, it is outlined with yellow color. Only charging adapters with output voltage (symbol: V or Vdc) rating closely matched to the laptop’s input voltage rating, should be used. Voltage rating can be a bit different, but not for more than 1V. Output current or amperage (symbol: A) rating of the charging adapter should be same or higher as laptop’s input current rating, but never lower. A device, in our case the laptop, will only consume as much current as it needs. If the power adapter couldn’t provide enough current, laptop’s vital components would be under-powered which could lead to system instability and premature failure of the charging adapter. Side note: Charging adapter’s maximum power rating, expressed in Watts (symbol: W) can be calculated by multiplying output voltage with maximum output current, for example 19V * 4.74A = 90W. Maximum power the particular charger can provide is 90 Watts. Since the decrease in the battery’s capacity or degradation of battery’s autonomy or simply a battery wear-out over the years of use is the most common battery fault, let’s start with battery capacity diagnosis. First, we need to figure out how to calculate an expected battery autonomy in regard to the laptop’s average power consumption. Battery’s capacity rating is usually expressed in mili Amper per hour (abbreviation: mAh) and essentially tells us for how long the battery, when full, can provide power. We can take a 4400mAh (4.4Ah) battery and a laptop with an average of 1.215A current consumption as an example. In the ideal scenario, a new battery with the 4400mAh rating should be able to provide around 4.4A for the whole hour, before being depleted. Laptop’s current consumption is not constant, it depends on the intensity of the work it carries out in any given moment. When the laptop is idle or it doesn’t perform any intensive work, its current consumption can drop to as low as 0.6A, since the power saving capabilities such as under-powering the GPU, parking unneeded CPU cores, decreasing the CPU frequency and dimming the display, are used. Quite the opposite happens when the user is running intensive applications – for example, on quad core CPUs all four cores with maximum frequency are being used, the GPU is using maximum power available to it, the hard drive is using power to write data, the fan is running full speed to cool down the system and the RAM is using all the power available to it. In a case like that, laptop’s current consumption could increase to a few amperes, depending on how power hungry its components are. How did I get laptop’s average current consumption? By measuring the laptop’s current consumption with a GetGui DC charging adapter with ammeter, without the laptop’s battery inserted. During normal use, I wrote down five lowest and five highest current readings displayed on the current measuring DC charging adapter, calculated the middle values and then the average current consumption. The average current consumption of this particular laptop is 1.215A. We can conclude that a new 4400mAh battery should be able to power our laptop, which has an estimated of 1.215A current consumption, for around 2.5 hours or 152 minutes. To get the old battery’s remaining capacity, we need to charge it to full, unplug the power adapter from the laptop and measure the time it’s able to power the mentioned laptop before it’s empty. Let’s say it takes 25 minutes before the laptop shuts down. First, we need to convert 25 minutes to hours – 25min / 60 = 0.416h. This concludes that our battery has decreased its capacity from 4400mAh when new, to 722mAh. The battery has only around 16.4% of the designed capacity left and should be replaced as soon as possible. There is also a more straightforward approach to check the battery, which doesn’t involve any complicated calculations and gives us an approximate evaluation of the battery’s capacity and autonomy. Start by discharging the battery by using the laptop until it shuts down. Plug in the GetGui DC charging adapter with ammeter, without powering on the laptop. Observe the current displayed on the charger. Note that actual current values may vary between different models of laptops and batteries, but the current jumps should be similar to the ones described below. It should display a standby current of around 0.01A – 0.02A for a few moments and then briefly jump to 0.05A – 0.09A. This means the battery is detected and is communicating with the laptop’s battery charging chip. If the charging is successfully negotiated, the laptop will start to charge the battery and the current will gradually increase to a few amperes, usually above 2A and stay there for some time. When the battery is fully charged, the current will gradually drop back to the standby current of around 0.01A – 0.02A. Write down the time it took to charge the battery in minutes and the highest current displayed on the charging adapter. Convert minutes to hours, example – 165min / 60 = 2.75 hours. To get a rough estimate of the battery’s capacity, multiply time to charge the battery with the highest current displayed. Example: 2.75h x 1.5A = 4125mAh. If the battery’s rated capacity was 4400mAh, 4125mAh would mean the battery is in good condition since it could be recharged to 93.75% of its designed capacity. In cases when the charging current decreases back to standby current after just 20 minutes, one knows the battery is in poor condition, without even calculating its capacity. That battery has almost reached the end of its usable life and should be replaced. Case 1: Current doesn’t increase from standby current of 0.01A – 0.02A even 15 minutes after plugging in the GetGui DC charging adapter with ammeter. This either means the battery is not detected – connected to the laptop properly, isn’t compatible with the particular laptop or laptop’s charging circuit is faulty. In some rare cases, it could also mean the charging adapter isn’t compatible with the laptop which then prevents charging as a security measure. Case 2: Current increases from standby current of 0.01A – 0.02A to somewhere around 0.20A – 0.50A and stays there for some time. This usually means the battery was depleted below the safe voltage and is in a deep discharge state. Deep discharge occurs when a battery is left unused for extended periods of time. The laptop’s charging IC chip uses a “trickle charging” method – a continuous constant-current charge at low rate, to prevent an additional damage to the cells. When the battery reaches the certain safe threshold voltage, it will begin to fast-charge with current above 1A, but it could take some time. Case 3: Current briefly increases from standby current of 0.01A – 0.02A to 0.05A – 0.09A and then back to the standby current. This means the charging was not negotiated, usually because the battery’s internal protection circuit is activated as a result of the battery’s over-charged state or an internal short circuit. Either way the battery should be properly discarded since it presents a safety risk. Electronics repair is not difficult, but it requires a lot of patience, calmness, focus, a steady hand and some common sense. When in doubt or when you do not fully understand something, educate yourself first by googling, before following the step in question. If you do not feel competent enough to follow a given procedure, it is best to seek help from an expert technician in your area. I cannot be held responsible for any damage caused to yourself, your equipment or to the device you are repairing as a result of following this tutorial.